The Baths of Trajan were constructed by the great architect Apollodorus of Damascus for Emperor Trajan right next to the smaller Baths of Titus. 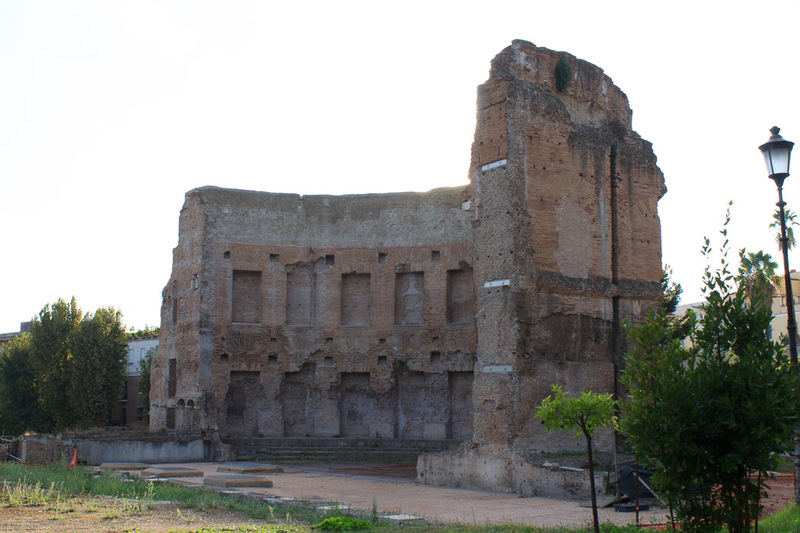 They were about the size of the Baths of Caracalla and the Baths of Diocletian which were built later. 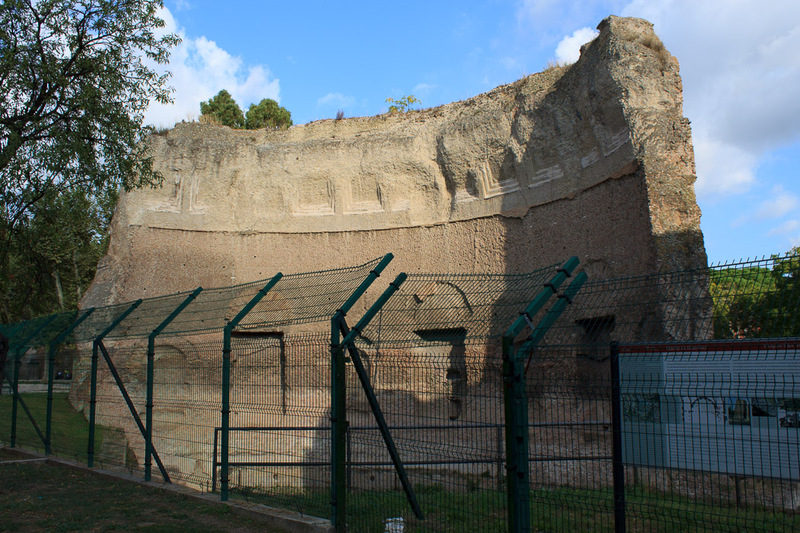 Only fragments survive within the park Parco Oppio, mostly consisting of three great exedra. 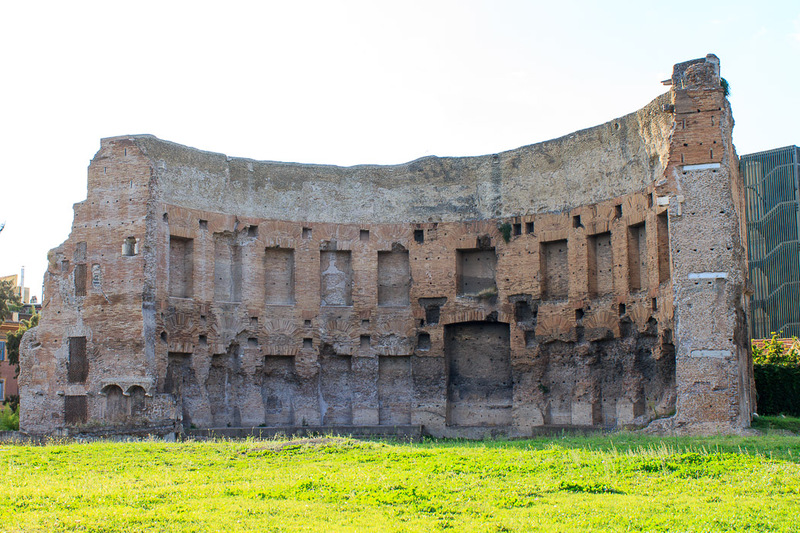 With the creation of these baths, the demolition of Nero's Domus Aurea was almost completed. The baths are currently (2012 and 2013 and probably several subsequent years) undergoing excavation and restoration, but are easily visible within the park. 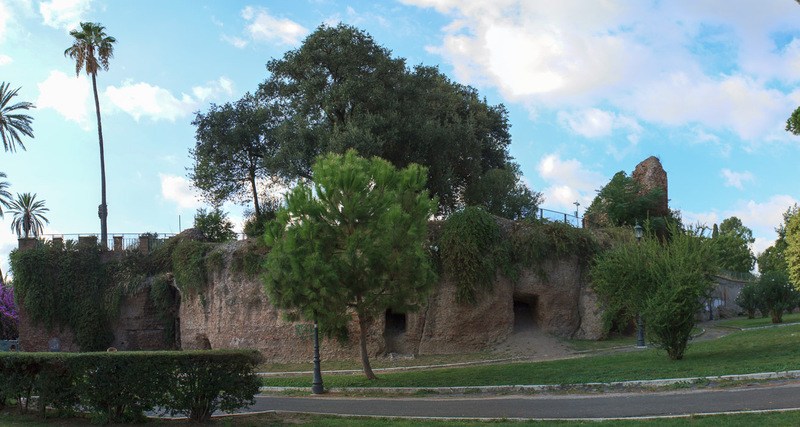 In the northwest corner of the park, at the intersection of Viale dei Monte Oppio and Via delle Terme di Tito. It is pictured from the inside in the 1st photo below, from the edge in the 2nd photo below, and from the outside in the 3rd photo below. There are explanatory signs at both the left side of the exedra (as you face the inside of it) and at the right side of the front. 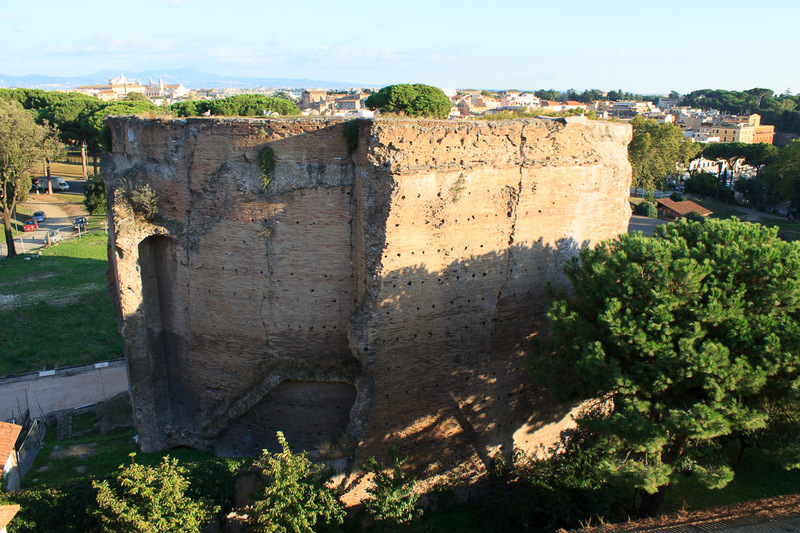 When you're at the right side of the front of the northwest exedra, there is a path which runs southeast away from the exedra, crosses Viale dei Monte Oppio, and continues to a large wall fragment on the right, with a lesser remains of an exedra just to it's left. That's the second exedra, pictured in the 4th photo below. See all Baths of Trajan photos. 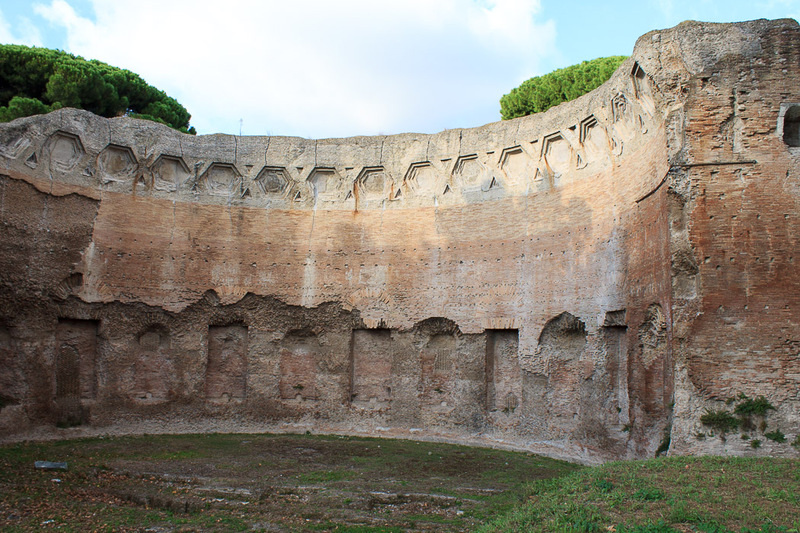 I must also admit that there are two other exedra that might be part of the Baths of Trajan, or might be part of the Baths of Titus; I just don't know. Start by entering the park from the south, from the stairway opposite the end of Via Celimontana. Once you climb the staircase, a short way down the path, on your left you'll see the exedra shown in the photo below, which is the first of those two exedra. For the second exedra, back up slightly to the road that runs back toward the Colosseum, which you'll find before you go back down the staircase. Head on that road toward the Colosseum and you'll reach a small parking lot on the right before you pass through the gate back onto the main roads. At the end of that parking lot is a large half-exedra on the left, and a shorter, continuing half-exedra on the right. You might be able to see these from within the park, but the fences preventing access are quite a ways back.